Smooth chocolate with a zesty warm ending. 1. In a small saucepan, over medium-high heat, combine cream and spices. Cook, stirring frequently, until mixture comes to a rolling boil. 2. Place chocolate chips in a medium bowl. Pour cream mixture over chocolate chips and let sit for 2 minutes. Stir until all chocolate is melted and mixture is smooth. 3. Add butter to warm ganache and mix well. Place in refrigerator for 1-2 hours until firm. 4. Using a teaspoon, roll ganache into 1-inch sized balls. Return to the refrigerator and chill until firm. 5. Melt CANDIQUIK® Coating in Melt & Make™ Microwaveable Tray according to package directions. 6. 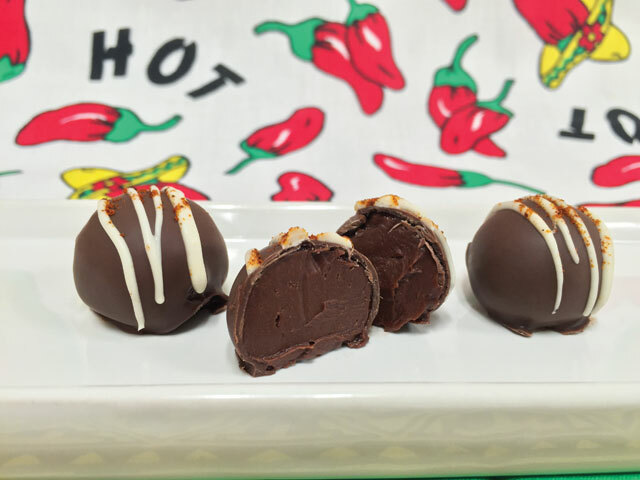 Dip ganache balls in melted coating; allow excess coating to drip off. 7. Place on wax paper and allow to set completely. Melt Vanilla CANDIQUIK® Coating, mix with spices to taste, and drizzle over truffles.